Meet our new Nature Play Garden, a place of whimsy and self-discovery, for learning and fun. You will be able to dabble in the water (try the boulder bubbler) or daydream on the grassy rolling hills. 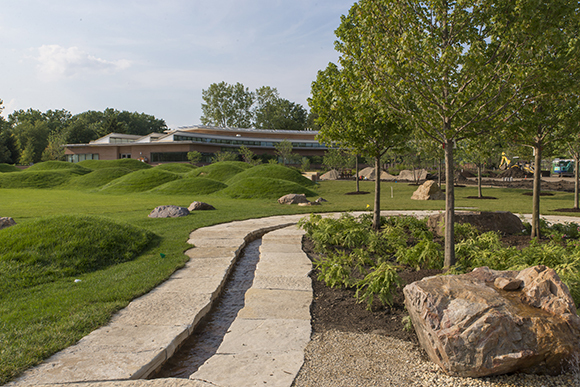 Experience the new garden at the free Opening Celebration of the Regenstein Learning Campus at the Chicago Botanic Garden on September 10 and 11. See the complete schedule for our Opening Celebration events on our website. Horticulturists selected the garden’s flowers and trees for qualities such as color, scent, texture, and even sound (the sweet gums trees have seed pods that rattle); more than half of the perennials are new to the Chicago Botanic Garden. “Adults will enjoy the fragrance of summer sweet and northern dropseed grass, smile at the large hibiscus flowers, be transfixed by the patterns of sunlight in the coursing water of the runnel, learn which plants do well in a swale to catch excess water runoff, and exclaim the usual ‘oh wow’ when the long sweep of redbuds flower in spring,” said Kris Jarantoski, executive vice president and director of the Chicago Botanic Garden. The big, grassy rolling hills are yours for interpretation. Lie down and read a book. Take a power walk. Here’s how we roll; show us how you roll (tag us on Twitter or Instagram, @chicagobotanic). 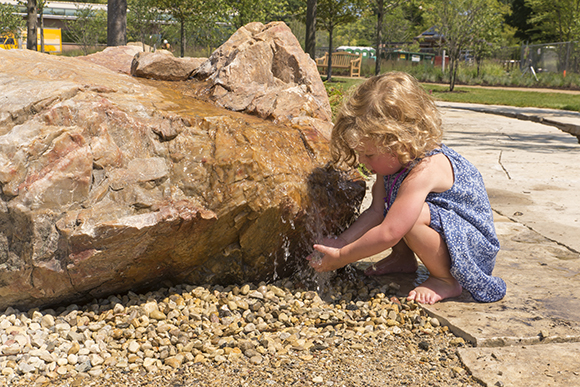 A young visitor discovers the boulder bubbler. Dip fingers and toes into the 2-inch-deep waters of the runnel. A boulder bubbler will allow people in wheelchairs to reach out and touch the cascading water at arm’s length. 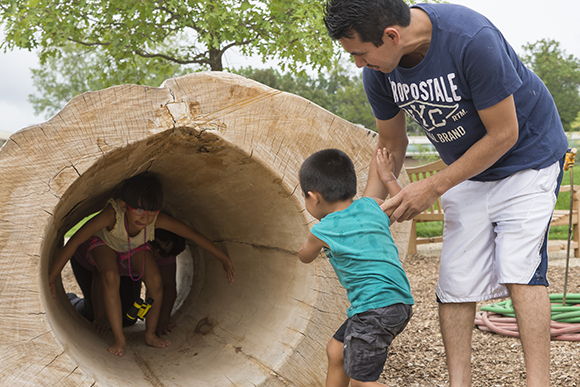 Kids enjoy going around, over, and through the hollow log—all afternoon long. 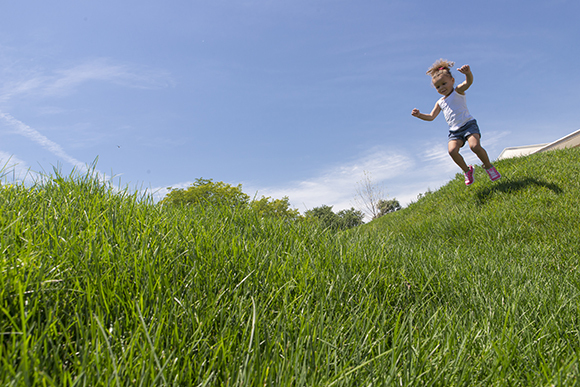 Jump off a boulder (wood chips on the ground make for a soft landing) or hide in a hollow tulip tree log (tulip trees, Liriodendron tulipifera, are also growing in the Nature Play Garden)—experts say it’s good for you to spend time outside. The garden was designed as a vibrant gathering place, for people of all ages and abilities. Check our website for evening programs that might call for stargazing or roasting marshmallows in the fire pit. Or pack a sack lunch and people watch in the picnic grove. Don’t feel like company? Duck into the hornbeam room or another sheltering thicket of trees. Explore the Nature Play Garden at the Learning Campus’s free Opening Celebration, September 10 and 11, 10 a.m. to 4 p.m.; parking fees apply. Enjoy live music and Family Drop-in Activities, take home a free plant, and more. Members can stop by the lounge for light refreshments and a commemorative gift. While you’re here, make time to visit any of our 26 other distinct gardens and four natural areas. It’s been another fantastic season at Butterflies & Blooms, which is open through September 5 at the Chicago Botanic Garden. This is my second year working at Butterflies & Blooms, and I think it’s looking better than ever. The biggest surprise this year happened this week. We received some big, hairy atlas moth cocoons, and I was a little concerned about whether they would have time to emerge before we have to shut our doors for the season. When I came into the pupae chamber a few days after they arrived, there was a giant female Attacus atlas staring at me, as if to say, “Ha! I showed you!” I chuckled to myself. Our volunteers had also assumed we might not have any more moths this season, so they were equally surprised. I brought it out of the display, its strong feet clinging to my finger. I reached far up into a serviceberry tree and placed the moth where visitors could get an ideal view. Just a few minutes later, a handful of photographers stopped by, and they happily snapped away. 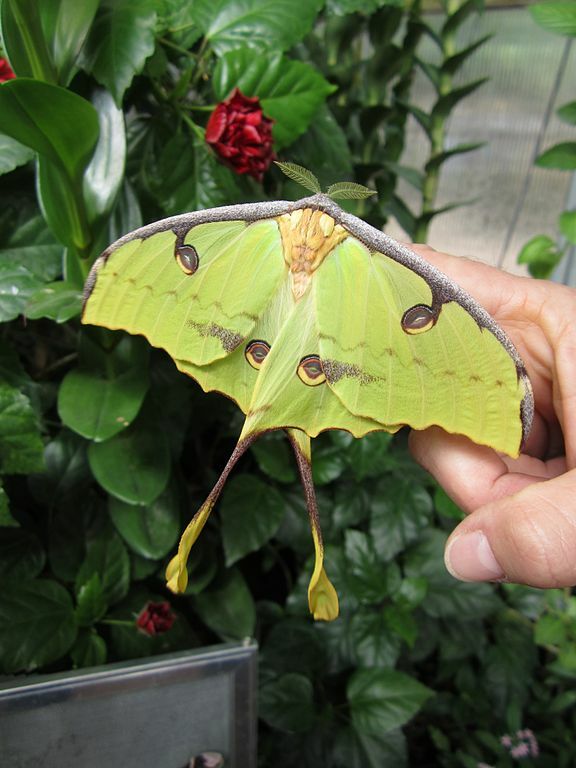 To make that week even better, a new African moon moth (Argema mimosae) emerged. 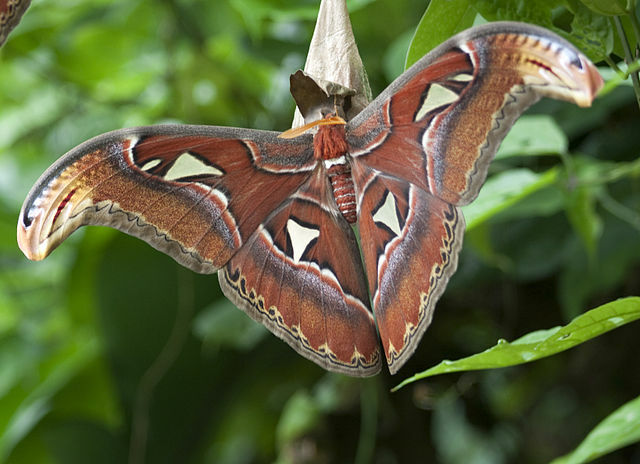 We are not sure if it’s male or female, so we decided to name it “Bobby.” Bobby and Aaliyah (the atlas moth) will definitely be hanging around for a couple of weeks, so come over and say hello. Butterflies & Blooms will be moving to its new home at the Regenstein Learning Campus in 2017. I can’t think of a more appropriate place for visitors to come to interact and learn about nature in some of its most beautiful forms. Being able to study and interact with nature has a profound effect on people of all ages, especially children. It awakens the childlike wonder that we all have. It certainly has for me. See Butterflies & Blooms in its current location from 10 a.m. to 5 p.m. daily through September 5, 2016. This September, find even more ways to learn, play, and get inspired. Our new Nature Play Garden’s plants and natural features encourage discovery, sensory interaction, and imaginative play. But the best learning opportunities you’ll find on the Regenstein Learning Campus come from horticulturists and educators with lives deeply rooted in nature. Here are a few of their personal stories. Explore the Nature Play Garden at the Learning Campus’s free Opening Celebration, September 10 & 11, from 10 a.m. to 4 p.m. (parking fees apply). See the complete schedule for our Opening Celebration events on our website. 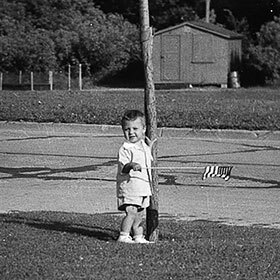 I grew up in a suburb of Milwaukee, Wisconsin. We lived across the street from a woods and river, and I played there all the time. With friends, we built forts and swung around on grapevines. I noticed that the hawthorn flower had a funky smell, and to this day, whenever I smell hawthorn flowers, I’m transported back to those woods. My parents took me to visit Mitchell Park Conservatory and Boerner Botanical Gardens. Boerner Botanical Gardens especially made a huge impression on me. It had gardens on a scale that I did not have at home and a diversity of plants from around the world that could never fit into my yard. It expanded my horticultural horizons immensely and was a fantasy world to me. I started out in college majoring in music, playing the organ. In my sophomore year I took a botany class and was fascinated. I switched my major to horticulture and loved designing and planning gardens. Once I decided to pursue a career in horticulture, I knew it had to be working in a botanic garden. I got my dream job in 1977, when I started working at the Garden as an assistant horticulturist. Over the years I have been fortunate to work with talented staff to plan and plant 27 distinct display gardens and four natural areas. 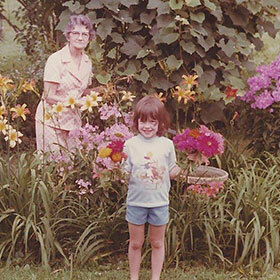 Here I am, at age 5, with my Grandma Kerr in her garden in Iowa, which we visited every summer. I loved her garden—she told me that she had a fairy living in her garden, and we would look for it as soon as we got there. 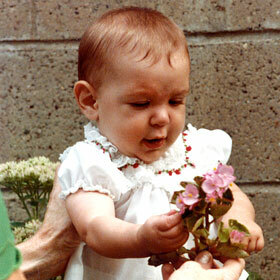 Her flowers were big and tall—almost unreal to me as a youngster. Her magical touch in nature really stuck with me; her flowers were amazing, and I did not see them anywhere else. I still carry that “garden magic” with me. I ask our camp teachers to have kids look for the magic in a seed, a tree, a pond—to take the time to just be in nature, whether that is listening to all the sounds in the Kleinman Family Cove, digging in the soil sandbox, chasing fireflies, or rolling down a hill—taking it all in—the sights, sounds, and smells. Ann helps in the backyard garden. My parents were born in Ireland, and, to hear them tell it, were outside every day. 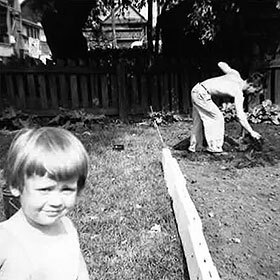 We lived on the west side of Chicago, and when I was 3 years old, my dad decided that we would put in a garden. I decided that he needed my help. We gardened, played under the sprinkler, jumped in puddles, and came home covered nearly head to toe in dirt just about every day. The influence of being exposed to nature—the pretty and the messy—has very much influenced my life. Having this childhood, with parents who encouraged us to “live” outside every chance that we could, allowed me to value its importance and led me to teaching children how to learn in and through nature. I grew up in suburban Pittsburgh, Pennsylvania, with a landscaped front yard and a wooded backyard. I spent hours jumping from stone to stone in my mother’s rock garden, picking blueberries from bushes in our front yard before the birds gobbled them up, and “designing” and planting the annual bed along the walkway to our front door. When I was 7 or 8 years old, my best friend and I were allowed to explore the woods by ourselves. One time we “discovered” a plant we called the umbrella plant. It was about 5 inches tall with horizontally held, fan-like branches covered in scale-like leaves. We excitedly brought it home and, although it didn’t last long, the impression did. This exposure to nature and being allowed to explore outside on my own shaped many aspects of my life, including my decisions to study plant science at Cornell University and earn a master’s degree in elementary education at Loyola University Chicago. 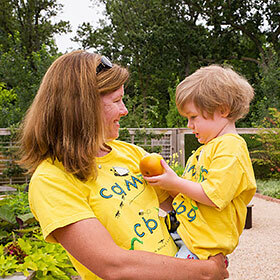 My position as family programs coordinator at the Chicago Botanic Garden combines my fondness for the natural world and my love of children and teaching. 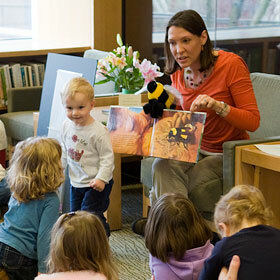 I look forward to teaching and sharing similar experiences with children at the new Regenstein Learning Campus. 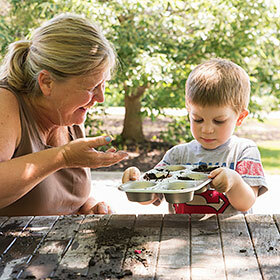 Discover more about our deeply rooted scientists, educators, and horticulturists in our previous post, Deeply Rooted: Garden educators, scientists, and horticulturists are made early in life. 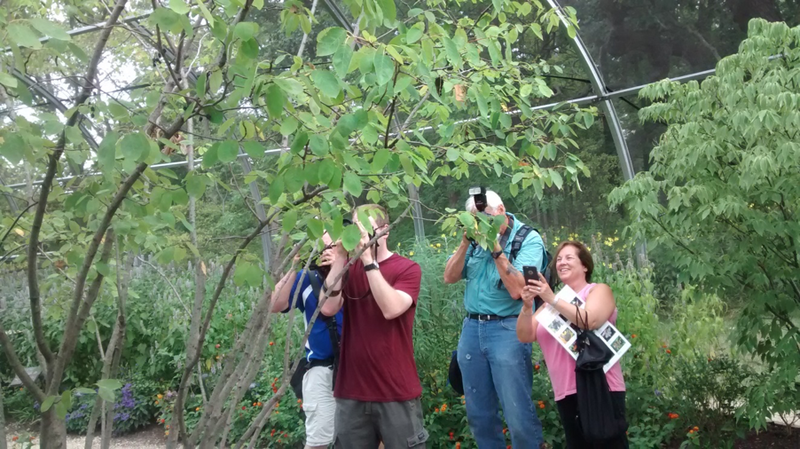 The National Parks provide dream vacations for us nature lovers, but did you know they also serve as vital locations for forward-thinking conservation research by Chicago Botanic Garden scientists? 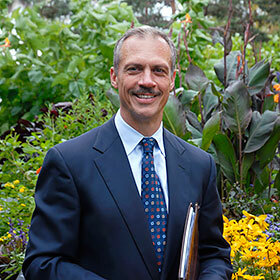 From sand to sea, the parks are a celebration of America’s diversity of plants, animals, and fungi, according to the Garden’s Chief Scientist Greg Mueller, Ph.D., who has worked in several parks throughout his career. As we celebrate this centennial year, he and his colleagues share recent and favorite work experiences with the parks. 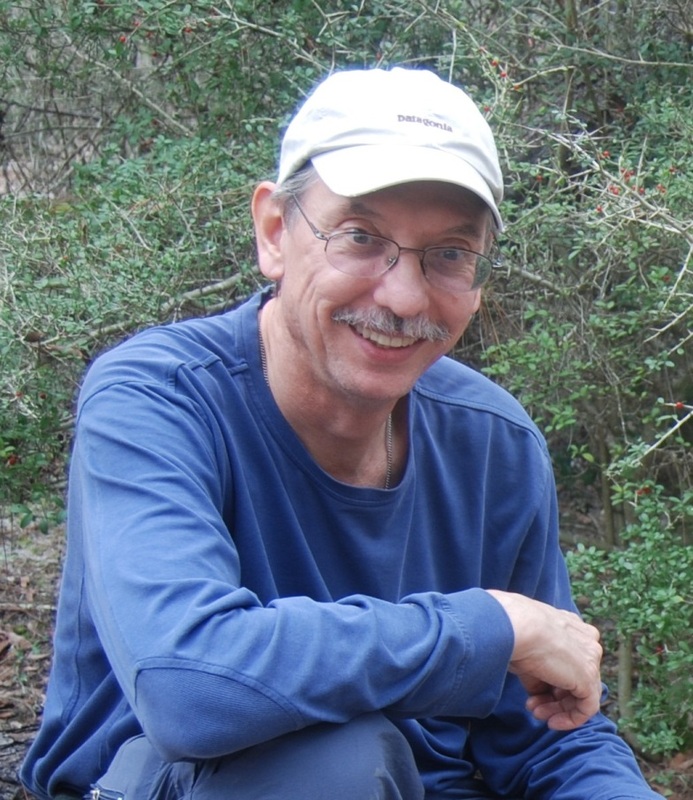 Dr. Greg Mueller working at Big Thicket National Preserve, Texas, in 2007. Take a glimpse into the wilderness from their eyes. This summer, Mueller made a routine visit to Indiana Dunes National Lakeshore to examine the impact of pollution and other human-caused disturbances on the sensitive mushroom species and communities associated with trees. “One of the foci of our whole research program (at the Garden) is looking at that juxtaposition of humans and nature and how that can coexist. The Dunes National Lakeshore is just a great place to do that,” he explained, as it is unusually close to roads and industry. 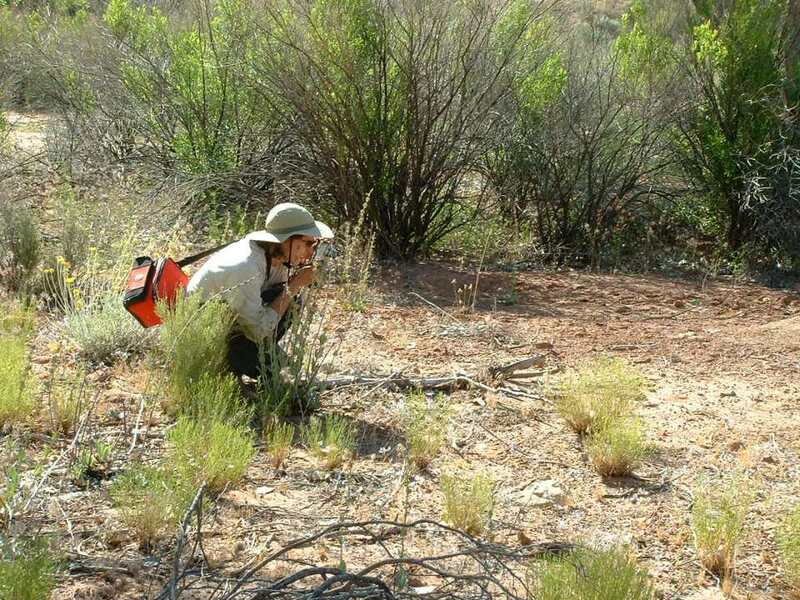 Evelyn Williams, Ph.D., adjunct conservation scientist, relied on her fieldwork in Guadalupe Mountains National Park to study one of only two known populations of Lepidospartum burgessii, a rare gypsophile shrub, during a postdoctoral research appointment at the Garden. “We were able to work with park staff to study the species and make recommendations for management,” she said. Dr. Evelyn Williams in Guadalupe Mountains National Park during 2014 field work. Photo by Adrienne Basey. 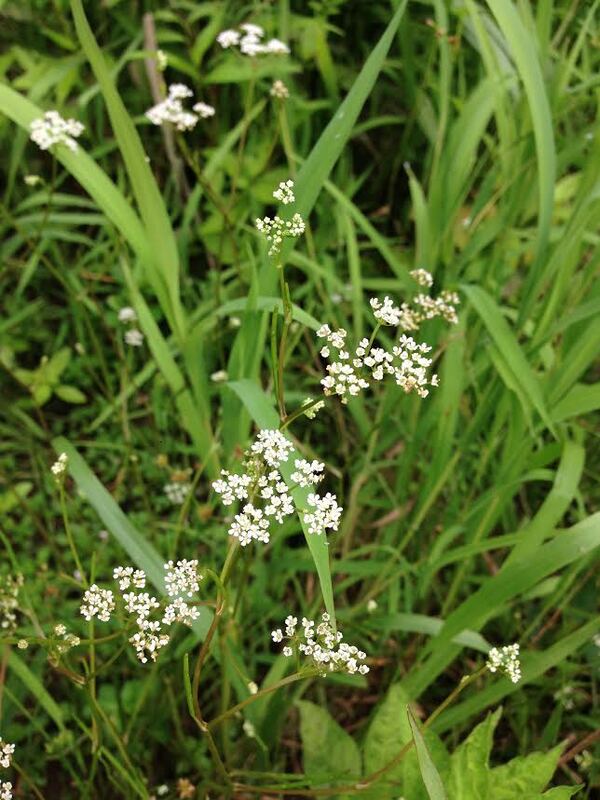 As a Conservation Land Management intern, Coleman Minney surveyed for the federally endangered Ptilimnium nodosum at the Chesapeake and Ohio Canal National Historical Park earlier this year. “The continued monitoring of this plant is important because its habitat is very susceptible to invasion from non-native plants,” explained Minney, who found the first natural population of the species on the main stem of the Potomac River in 20 years. Harperella (Ptilimnium nodosum) grows on scour bars of rivers and streams. Photo by Coleman Minney. 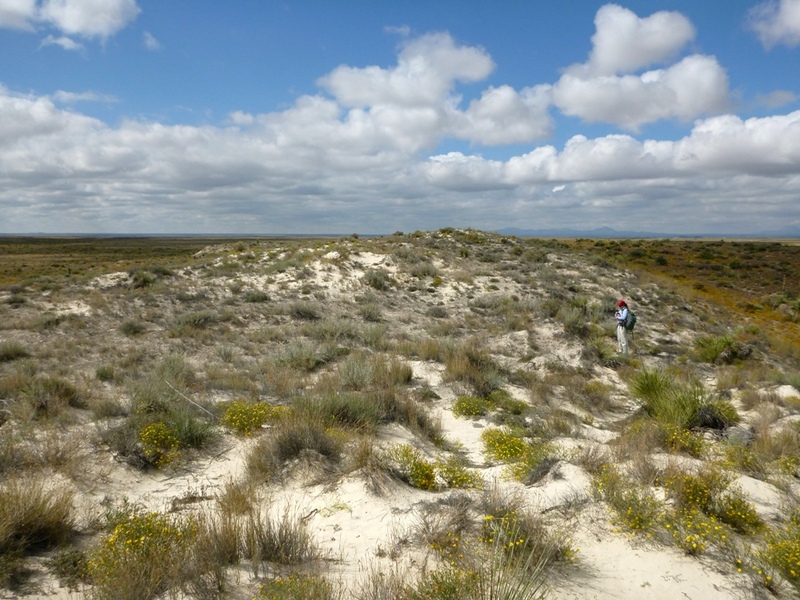 Today, she is evaluating the results of restoration at sites in the Colorado Plateau by looking at data provided by collaborators. Her data covers areas that include Grand Canyon National Park, Capitol Reef National Park, and Canyon de Chelly National Monument. Along with colleague Nora Talkington, a recent master’s degree graduate from the Garden’s program in plant biology and conservation who is now a botanist for the Navajo Nation, Dr. Kramer expects the results will inform future restoration work. Dr. Kramer collects material from Arches National Park as a part of her dissertation research in 2003. 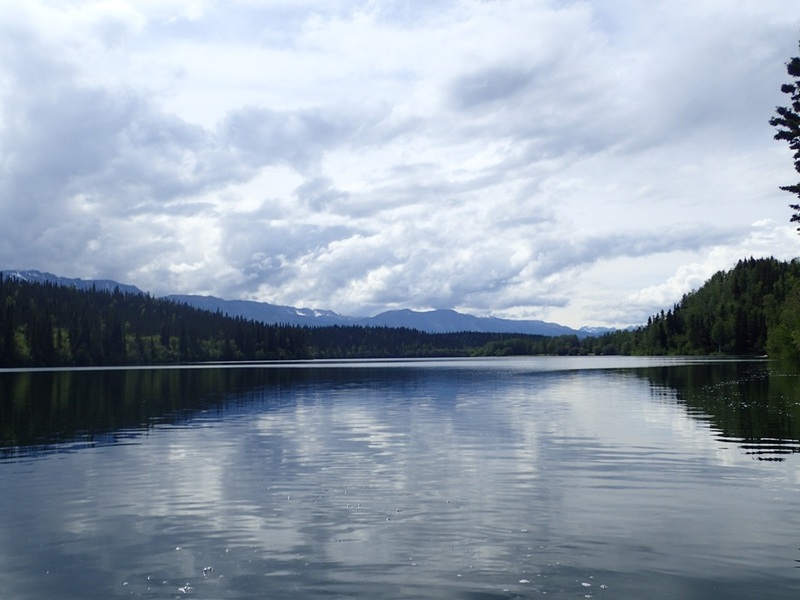 The view from survey work in Elodea, part of the Wrangell–St. Elias National Park Preserve in Alaska. Photo courtesy National Park Service. For research and recreation, we look forward to the next 100 years.